beach or from your very own back yard! 1. Use masking tape to secure a piece of construction paper onto your working surface. Pour some glue into a paper plate or shallow dish. The glue blob should be big enough to press a hand into it. Curve each hand into a hook shape (like the picture) and dip it into the glue. 2. Press your hook shaped hands onto the construction paper, making your hands walk across. 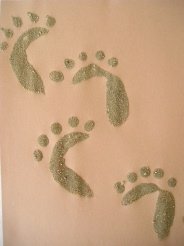 Wipe your hands off and then dip each finger into glue to make five toes on each of your foot prints. 3. Sprinkle sand over top of the glue and shake off.